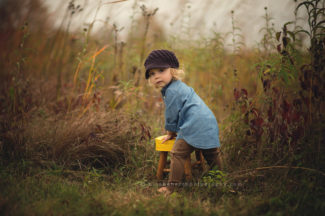 Once our littlest clients aren’t newborns anymore, it’s time to think about baby milestones and children’s portraits. We invite you to discover the organic moments, sincere expressions, and the use of light and nature captured in our children’s portraits. Sessions are held outdoors and photographed 1-2 hours before sunset. Baby milestones will be scheduled indoors only during inclement winter weather months. Please stick to babies’ and small children’s typical napping and bedtimes when scheduling the best time of year for portraits. Around the summer solstice the sun sets just shy of 9 pm. This is great for our tiny night owls; early sleepers may do better during the weeks of earlier sunsets. For many parents, this is the most stressful part. We’ll help! We have a guide to help you style, choose wardrobe and accessories. Darcy’s style uses soft-tones, warm neutrals and earthy colors found in nature. 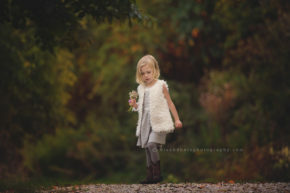 This organic styling allows your child to be the shining star and this recipe of soft colors, beautiful light and authentic moments means beautiful portraits! 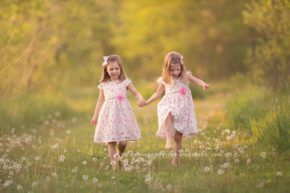 Styling and wardrobe is available for infant milestone sessions. About 3-4 weeks after your session, we invite you back to the studio to see your child’s images. You will see your gallery of beautifully edited images, as well as all the gorgeous products available to you. Your order will be placed at this Viewing & Ordering Session, and we will let you know when you can anticipate your products to arrive. Typical turn around time is about 7-10 business days for prints, longer for specialty items such as albums and frames. Getting real, beautiful images of your loved ones on the wall is something that is important in our own home, and we know it’s important to our clients as well. We have scoured available vendors and discovered products that we’re proud to show in our studio, home, gift to love ones, and we believe you’ll love them as well. We offer swoon-worthy wall prints, gift prints, albums, canvases, fine-art folios, custom frames, and holiday cards. While digital collections are available, we are artists and our goal is to provide artwork; we can’t wait to show you all the gorgeous products! Ready to book your child’s portraits? Wonderful! We’d love to be part of these memories! Please contact us to start planning your child’s session.